I know I'm not the only Mom who is always looking for something a little bit different, something original for the kids to take to school. I mean, that's why we all LOVE Pinterest so much right? Well, Halos sent me a bunch of little craft goodies and I just totally fell in love with these little Halos Love Bugs! They're perfect for the kids to help with, cute, simple and not candy. So nice for a change. One of the most important things to me, when it comes to my family is making sure we are always making memories. We are lucky enough to always have something fun on the books. But even the everyday moments are important to me and one of my favorite ways to spend time together as a family is when we all play outside. Toby is ALWAYS up for playing and we can play keep away and fetch and tag for hours. At least once a week we visit Target. Sometimes for things we need, sometimes just to walk around , which makes it another place we tend to make our every day memories. You really have to stop and realize that even when you're trying on funny Halloween costumes, buying a new favorite book, movie or toy, you're making memories. If we could take Toby into Target with us, it would be perfect and believe me, my husband has asked. He would love to play in the pet section, that is where you will find Purina Dog Chow. Purina has brand new packaging and after 90 years of making dog food, I love that Purina grows with your dog. We go from Puppy Chow, to Dog Chow Small Dog and eventually graduate to Complete Adult. So the other day when I was cleaning out all of the clothes that my girls have outgrown, I left the pile in the corner of the room for when I actually have time to donate them, you know how that goes. A week later, that pile became one of Toby's favorite places to nap. Which gave me an idea, what if I use some of the girls old clothes to make a special toy just for Toby. This project literally took me all of 5 minutes. 5 minutes of making this toy all for endless hours of fun and making family memories. First, figure out the colors you want to use. I was inspired by the colors of our favorite sarape and by the look of our pile of clothes, we love bright colors. Next, cut the clothes along the width of the shirt. You will need 2 strips of 4 different colors. Stretch the strips to their max, without ripping them. Choose the 3 colors you will use for the braid, and 1 color to use to tie the ends. Lay down the strip you will use to tie and lay the other three colors on top. Tie the top end. Braid all the way down. Right over middle, left over middle and repeat to the end. Tie with the last strip. Done and done and hours of fun with the whole family. You can follow Purina on all of your favorite channels below. A family unit never quite seems complete until there is a four legged family member wagging their tail nearby. I always tell Toby, our family dog, just how lucky he is that he ended up with us for a forever family. Toby came to us 2 years ago almost to the day, after being left on my best friends porch at only 6 weeks old. And just like the rest of the members of this family, we have to celebrate his birthday too. I am not one of those parents that dread the Summer months. When Summer approaches all I can think about is filling our days with fun and colorful projects. The way I see it, my kids don't do nearly enough Art in school, which means, the Summer is our time to be creative! I love being able to spend all day outdoors, playing, getting dirty and making memories. The thing about kids though, is that nothing keeps their attention for as long as you hope. So, after 20 rounds of Loteria, which also doubles as a Spanish lesson, they are ready to move on to another activity. I have been wanting to do some tie-dye projects with my girls for a while now. Well, two days into Summer Break sounds like the perfect time to me. I used our Loteria game as a jumping off point for what we were doing next. I kept talking to them about the vibrant colors on the Loteria cards and when I brought out the tie-dye projects they were thrilled! They loved the idea of designing and creating their own Summer shirt. 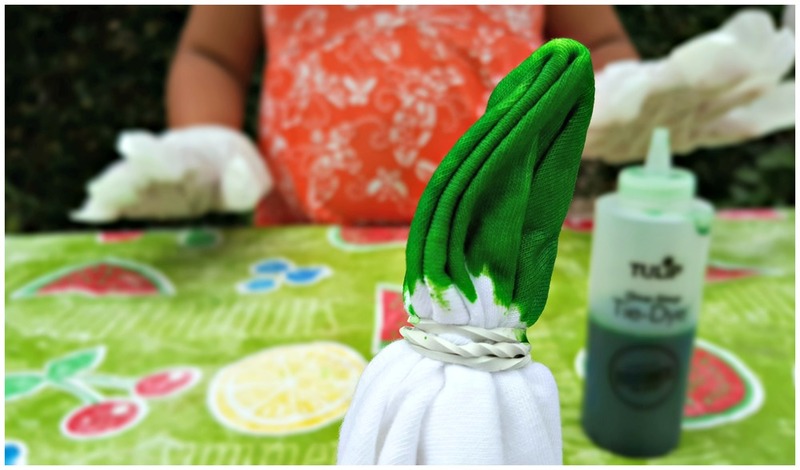 Here's what you'll need to create these awesome Summer Tie-Dye tops! This project is pretty simple and definitely messy, just how I like them. If you purchase the fabric dye, tie-dye kit like me then you will have your own directions to follow. If not, it's still really simple and I'll break it down for you. Pre-wash your shirt with all® Fresh Tropical Mist™ and get ready to make a mess. Lay out an old tablecloth or paper that you won't mind ruining. Also, wear gloves if you have them to protect your fingers and have a lot of paper towels or napkins on hand for any accidental spills. Figure out the kind of pattern you would like to create with the tie-dye. My daughter wanted a burst from the center of the shirt. So we laid the shirt out flat, and gathered from the center. Use rubber bands to separate the shirt by sections. Add the dye to the section that you want colored. Note: Be careful with the dye, you want to keep the colors as separate as possible so work slowly. 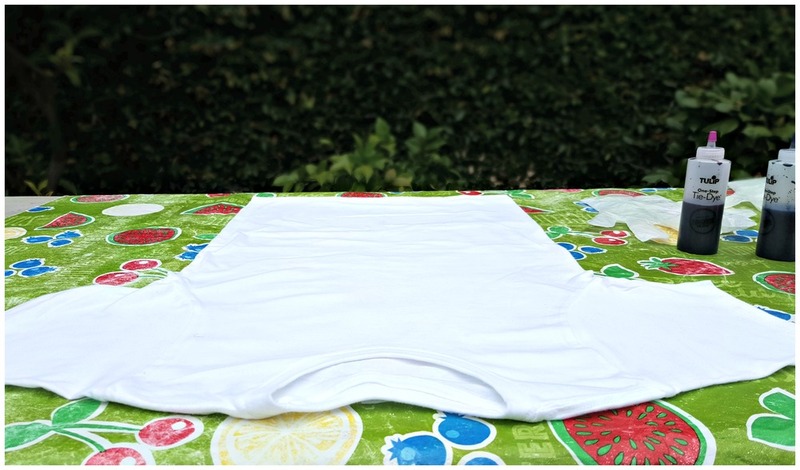 Wrap the shirt in plastic wrap and set aside for 6-8 hours; Longer for brighter colors. When you are ready to rinse, fill a bucket or sink with water and rinse slowly. Once you've completed your first rinse, add a small amount of all® Fresh Tropical Mist™ to the water and rinse again. My girls wanted to make the shirts their own, so we searched on pinterest for ideas and I helped them to finish the looks. My absolute favorite scent is the smell of clean laundry. I decided to make things a little more interesting and switched to a new scent for the Summer, all®’s newest Fresh tropical scent. You can bring the freshness of the tropics home with the trusted cleaning power of all®. Of course, as messy as we all plan on getting this summer I need all®’s trusted stain fighting power to fight the toughest kid stains like grass, mud, and grape juice. It's also nice that all® costs 30% less than the leading brand. Once we were done dying, washing, drying and cutting our new shirts. We had to try them on! As you can see, they loved the way they looked and smelled! Part of making memories includes the smells that surround you and I know that when they think back to the time they got their hands dirty while making their own tie-dye shirts, the fresh tropical scent will go along with it. To find NEW fresh tropical mist in store near you, visit all®'s website and don't forget to grab your coupon! This post is sponsored by Big Lots. You can find this post in Spanish over on Big Lots Latino. One of my favorite things about being a mom to two little girls, is keeping the magic alive. I want them to believe in magic for as long as possible. When we talked about Spring coming soon, we decided that we need to thank the fairies for bringing Spring to our backyard. We headed to Big Lots and picked up everything we were going to need for our very own Fairy Garden. The best part about this project was that this was something that I could do with them, it was a chance for us to spend time together—albeit while getting a little bit dirty. For me and my girls, playing in the dirt never gets old. This is probably my favorite step in creating a Fairy Garden, adding the soil. To start, you'll need potting soil, a container for the base and some garden tools. After adding a layer of soil, we laid out the Roll Out Flower sheet that is full of seeds and cut it so it could fit the base. We also cut out a circle for the fairy's house. Next, per the instructions on the box of Roll Out Flowers, we watered the sheet full of seeds thoroughly. In fact, we soaked it. Word to the wise, stay in control of the water hose because kids with a water hose can be messy. There were quite a few options of Fairy Houses to choose from at Big Lots, after much debate between my daughters we settled on the toadstool house. Next, we covered the sheet of Roll Out Flowers with a little bit more soil and then started on the decorating. I had some of these stones in a vase and thought they would make a perfect stone path for so the fairy can find her way. We were also lucky enough to find the perfect additions to our Fairy Garden, a welcome sign and a mail box, because would any Fairy house be complete without it? I don't think so. This is what our Fairy Garden looks like before the grass and flowers grow. Notice in the background, I also found some small hummingbird feeders at Big Lots that compliment our garden very nicely. Because, according to my 5 year old, Hummingbirds and Fairys are very good friends and maybe even cousins. My girls check on our Fairy Garden every day and with each flower that sprouts, they continue to believe in magic. The magic of our planet is pretty remarkable and I love that they will grow up appreciating all that the Earth has to offer. Projects like this are the best, I spent time with my girls talking about magic, playing in the dirt and making memories. Thank you Big Lots for having everything we need to create our very own Fairy Garden. It's been 13 years since we all fell in love with the super forgetful and equally charming Blue Tang fish named Dory in the 2003 animated film Finding Nemo. This June, the highly anticipated Disney•Pixar's “Finding Dory” will hit theaters and we will be reacquainted with some of our favorite characters and meet some exciting new friends as we tag along on Dory's journey. Disney•Pixar's “Finding Dory” welcomes back to the big screen everyone’s favorite forgetful blue tang Dory (voice of Ellen DeGeneres), who’s living happily in the reef with Marlin (voice of Albert Brooks) and Nemo (voice of Hayden Rolence). When Dory suddenly remembers that she has a family out there who may be looking for her, the trio takes off on a life-changing adventure across the ocean to California’s prestigious Marine Life Institute, a rehabilitation center and aquarium. In an effort to find her mom (voice of Diane Keaton) and dad (voice of Eugene Levy), Dory enlists the help of three of the MLI’s most intriguing residents: Hank (voice of Ed O’Neill), a cantankerous octopus who frequently gives employees the slip; Bailey (voice of Ty Burrell), a beluga whale who is convinced his biological sonar skills are on the fritz; and Destiny (voice of Kaitlin Olson), a nearsighted whale shark. Deftly navigating the complex inner workings of the MLI, Dory and her friends discover the magic within their flaws, friendships and family. Get your kids ready for Finding Dory with these fun Printable Activity Sheets! FINDING DORY swims into theaters everywhere on June 17th, 2016! My favorite thing about Spring is all of the colors. I love that suddenly colors show up everywhere, from flowers, to clothes, to decor, to food. Color is everywhere! Have you seen the new Diet Coke "It's Mine" bottles? I found them while shopping at Albertsons the other day. They are, to put it simply, really pretty. They are covered in fun colors and designs and each glass bottle is unlike any other. Cool right? Diet Coke is my go-to pick me up for during the day and when I'm out and about. The colorful designs inspired me to get my mantle ready for Spring. The colors reminded me of stained glass, which made me think about making my own SPRING stained glass banner. I always have tons of tissue paper scraps laying around, so this worked out perfectly. Also, I find that having a bottle of Diet Coke to drink helps with the creative process. Cut your paper to the size you want your banner to be, mine are about 4x6. Cut out the letters S-P-R-I-N-G. I like to freehand the letters, but you can always use a template or cutting machine. Run a glue stick around the letters and lay your tissue squares on top, to cover the letters. Lay them out to be laminated. Trim the extra lamination from around the banner. Punch a hole in each corner and string them together. Tie the strings to a few skewers and then place those skewers into a Diet Coke "It's Mine" bottle on each side. See? How pretty is that? Crazy how inspiration comes from everywhere. It is so important to always keep your eyes open to any source of inspiration. I love the glass bottles, but you can also find the Diet Coke "It's Mine" designs on plastic bottles, aluminum cans and aluminum bottles of Diet Coke too. These bottles are only available for a limited time (while supplies last) so if you see them around, grab one, and soak in all of the colors and designs. Right now, Albertsons is partnering with Diet Coke for a fun contest. You could win 1 of 10 VIP prize packages for 2 to Los Angeles to see Primetime TV's biggest awards show. The prize package includes hotel, travel gift card, pre-party reception, gift bag and tickets to the award show. All you have to do to enter is snap a selfie with your favorite Diet Coke "It's Mine" bottle or can and share it on Twitter or Instagram with the hashtag #ItsAllMineSweepstakes! Easy! For more information on the sweepstakes and to discover your entry, check it out here. Note: Regarding Twitter and Instagram, your account settings must be set to "unprotected" and/ or "public" in order for your tweets to be visible to enter the sweepstakes. once your entry is submitted your entry picture will be added to the microsite. If your photo does not appear within 24 hours, your entry did not submit appropriately (check for appropriate hashtag and whether your Twitter/Instagram was made public prior to your submission). It seems like only yesterday that I was grocery shopping with my Mom and begging her to buy Kid Cuisine meals for me. Life has come full circle and now here I am buying Kid Cuisine meals for my kids. The only difference is that my girls don't have to beg me to buy them, in fact, I like to buy them as a surprise. I am not ashamed to admit, sometimes I don't want to make dinner and Kid Cuisine meals make my life easier and my kids happy. I feel good about giving my kids Kid Cuisine because they offer wholesome ingredients, like 100% natural chicken breast, real cheese, whole grains, and a yummy dessert that they’ll love. All with NO preservatives. While shopping at Walmart, I found that the Kid Cuisine meals have partnered with Skylanders Battlecast. I had no idea how cool this was until my kids told me, because of course they knew what Skylanders was and they just had to have the FREE Skylanders Battlecast card that is found inside the specially marked Kid Cuisine meals. So as cool as Kid Cuisine meals are, I wanted to step it up a little bit. I decided to make a re-usable place mat with some fun activities to keep them entertained while they wait for their dinner to heat up. The place mat that I created is here for you to right-click, save and print below. To make this place mat reusable all you need to do is laminate it. I have a laminator on hand so it was very easy for me, but don't worry, if you don't have a laminator you can use a clear page protector. You are welcome to save and print the one above or make one of your own. I included a maze, a spot for them to write about their best part of their day, a face for them to complete, a spot to play Hangman and to play Tic Tac Toe. It just so happens that the Chicken Nugget Kid Cuisine meal comes with Tic Tac Toe cookies for dessert. Just add a couple dry erase markers or pencils to the dinner table and you and your kids have a lot of fun activities to keep dinner interesting. Another thing that has changed a lot since my mom was buying Kid Cuisine meals for me is the use of coupon and rebate apps. You have to download the Ibotta App, check it out HERE to stock up on Kid Cuisine where you can Buy 3 Kid Cuisine meals and earn $2. That's a great deal! This is my new favorite thing. I've been scanning my receipts left and right. See how easy it is to have a fun and easy dinner for the kids. Next time you're at Walmart, stop by the Frozen Entree aisle and pick up a few Kid Cuisine meals. Everyone will be happy and with all the time you save washing dishes you can download the Ibotta app and save yourself some money. ©2016 Activision Publishing, Inc. SKYLANDERS, SKYLANDERS BATTLECAST, and ACTIVISION are trademarks of Activision Publishing, Inc. © ConAgra Foods, Inc. All Rights Reserved. It's the end of January and I hope everyone is holding on to their New Year healthy eating goals. This year, my motivation for eating healthier is my status as a Matron of Honor in my best friends upcoming wedding (T-minus 6 months). That's great motivation right? So, how do you keep things interesting on those days that you are trying to keep your calorie count low? Well the other day while on a trip to Walmart, I picked up some of my favorite lunch options. Keep reading to see how I add flavor to a healthy lunch. The juice aisles at Walmart called to me and although I usually look past, I was pleased to find V8 V-Fusion® and V8 V-Fusion® light. V8 V-Fusion® is 100% juice and offers the nutrition of vegetables blended with just the right amount of fruit juice for a light, sweet taste – plus 1 full serving of fruit and 1 full serving of vegetables. See that's the thing I miss most when I'm dieting. I miss flavor and fruit! Today I'm sharing with you some of my favorite 500 calories or less lunch combos. You can never have too many healthy lunch options right? These are just some of my favorite properly portioned healthy snacks all paired with a yummy V8 V-Fusion® or V8 V-Fusion® Light to add extra flavor and serving of fruit and veggies. These are just a few of my favorite properly portioned snacks all in one lunch adding up to 500 calories or less. I like to mix textures and flavors just to keep it all from getting boring. Below I have all the items listed with their calorie count included. I used to think V8 was only tomato juice and I'm so excited that they have some really delicious flavor combinations now. Everything you see above was bought at my local Walmart including the various flavors of V8 V-Fusion®. I found Strawberry Banana, Pomegranate Blueberry, Peach Mango and Acai Mixed Berry in both regular and light varieties. So not only have I been able to add flavor to my low-cal lunches but guess who enjoys these too? My kids! They were so excited to try them and loved them. Of course, it's just a mom bonus that they are healthy and include one full serving of fruits and veggies, meaning I don't have to fight with them about eating their calabasitas that day. So what do you think? Will you add my V8 V-Fusion® or V8 V-Fusion® light to your day? I'd love to hear some of your healthy lunch options too, leave me a comment below.